Back in October Capcom released the highly anticipated Resident Evil 6 and ... encountered unexpected disapproval. Apparently their fan base didn't take kindly to RE6's attempt to move the franchise away from its survival horror roots and into the action genre. 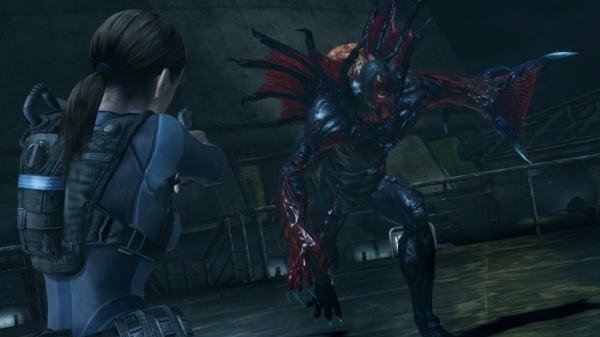 By porting the popular 3DS Resident Evil game, Resident Evil: Revelations, to consoles and PC, Capcom attempted to reconnect the Resident Evil franchise with its roots and disenfranchised fan base. They were mildly successful. Revelations pits the Bioterrorism Security Assessment Alliance (BSAA) against the bio-organic weapons (BOW) terrorist group Veltro, which is destined to release the T-Abyss virus into the world. The BSAA loses contact with its agent Chris Redfield and his partner Jessica while they are on a mission in the Mediterranean Sea aboard the cruise ship Queen Zenobia. It sends Jill Valentine and her partner Parker to investigate, but when they arrive they find that they've been set-up ... and that the ship has been infected with the T-Abyss virus. When word reached Chris that Jill is stranded, he drops his actual mission and goes off to find her. Each of the game's episodes transitions between the storylines of the lead and side characters, and uses flashbacks to fill in the back story and toss in some plot twists as well. The game pulls this off beautifully, adding a lot of depth to the story and insight into how the characters got to where they are in the story. If by chance any of this confuses you, the game provides a handy recap at the beginning of each episode to help keep you on point. I really like this feature and other developers should take a hint and model after it. Every Resident Evil game cannot be considered complete without those moments of fear, anxiety, suspense, pressure, and relief, and Revelations delivers them. There is nothing like being in the middle of the ocean on a tightly confined cruise ship with infected monsters seeking blood. With each turn down or a corridor or opening of a door you always be thinking to yourself about what could be waiting for you there. You will also find yourself checking every nook and cranny just to make sure you have killed everything, only to find that all of a sudden out from the depths of an elevator shaft or air duct comes a slimy eight foot monster reaching out to lend you a hand. While I was surprised by, and at times felt some of the pressure of, too many enemies, I quickly realized that they tend to be rather dumb and sluggish and that I could just run away. There is a dodge ability that can be executed when in close combat, however it can be hard to execute at times and it is easier to just keep running. What is consistent throughout all Resident Evil games is the sense of anxiety when blowing through a ton of ammo and feeling like you are on the verge of not having enough, when low and behold the ammo gods bless you with more. One of the new ways the game has you searching for ammo and health outside of the usual opening of lockers and smashing of boxes is by using the Genesis. The Genesis is a scanner that detects items around the environment that wouldn't normally be seen with the naked eye. The scanner can also be used on the enemy, and with each successful scan you accumulate a percentage number; when the numbers total up to 100% you are rewarded with a health potion. In the end the constant scanning ends up being a huge distraction and pointless addition to the game, though. As usual, at the end of every stage and episode you are graded as if you are in elementary school. The grading criteria consists of accuracy, time to complete, and number of deaths. The higher the grade the more BP the player receives, with BP being the in game currency used to purchase weapons, costumes, and weapon customizations for Raid Mode. Raid Mode is a single or co-op mini game which reuses the campaign stages and throws in a variety of enemies. Similar to the campaign you are graded on accuracy, enemies killed, damage done and time the stage was complete to earn BP currency. The "gotcha" with Raid Mode is you don't regenerate ammo. You find yourself either scrounging for ammo in the stage or purchasing more with BP. Weapons also come with special abilities such as daze, earn more BP, reload faster, fire rate increase, etc. Mix and match to create the ultimate fighting machine or to become a BP farmer. Even the characters that can be used have special abilities that may prove to serve better against certain enemies or weapon combinations. Don't go rushing straight into Raid Mode though because it will be short lived exercise. In order to unlock more stages you must complete the campaign and along the way more stages will become available. Replay value has never been a top priority for the series, and Revelations is no different. However, don't let that sway your decision on playing this game. Porting Revelations to make it readily available to millions of gamers was a smart move by Capcom, but if you have played the 3DS version already then there is nothing new here for you. For everyone else, Capcom has done console and PC gamers a favor in providing a thrilling and riveting addition to this truly evil series.